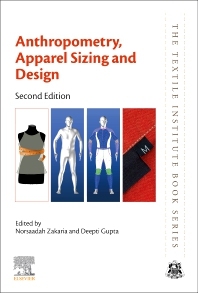 Anthropometry, Apparel Sizing and Design, Second Edition, reviews techniques in anthropometry, sizing system developments, and their applications to clothing design. The book addresses the need for the improved characterization of population size, weights and the shapes of consumers. This new edition presents the very latest advances, and is expanded to include in-depth coverage of sizing and fit for specific groups and applications. Sections cover the development of sizing systems, classification and body types, the use of anthropometric data, body measurement devices and techniques, including 3D scanners for the full body and for particular body parts, 4D scanning technology and motion analysis. Additional sections cover testing and the evaluation of fit and anthropometric sizing systems for particular functions, thus reflecting the increasing need for apparel to meet specific needs, such as in swimwear, protective clothing, mobility, intimate apparel, footwear and compression garments. This book will be an essential reference source for apparel designers, manufacturers, retailers and merchandisers. Its detailed information and data will also be of great interest to researchers and postgraduate students across clothing technology, product design, fashion and textiles. Norsaadah Zakaria is the founder of the Centre of Clothing Technology and Fashion, at the Institute of Business Excellence, Universiti Teknologi MARA (UiTM), Malaysia. Her main research interests include traditional and 3D body scanning anthropometric survey, modelling and data for clothing sizes, shape analysis based on anthropometric data, and sizing system optimization and validation using data mining.